The surplus of income over expenditure was Rs 111.83 crore as against Rs 166.87 crore in the earlier year. IMAGE: Cheerleaders perform during the IPL. Photograph: BCCI. The BCCI made a surplus of Rs 111.83 crore in the last fiscal, a dip of over Rs 55 crore as compared to the previous one, said its Treasurer Anirudh Chaudhry. "In the year under consideration, the surplus of income over expenditure was Rs 111.83 crore as against Rs 166.87 crore in the earlier year," stated Chaudhry in his annual report for 2015-16. "The drop in surplus was mainly due to distribution of additional amount due to associations, additional payments to players and absence of income from Champions League T20 Tournament (that has been scrapped). All this despite an increase in total income as compared to previous year," he stated. In the current fiscal (2016-17), the budgeted surplus was estimated at Rs 509.13 crore, according to the BCCI treasurer. He has also cited that the expenses on cricketing operations (excluding Champions League T20) had increased from Rs 311.21 crore to Rs 370.04 crore and the provision for gross revenue share payable to the players had gone up from Rs 10.47 crore to Rs 56.35 crore due to corresponding increase in gross revenue income. The annual gross receipts at the end of the previous fiscal from men's senior international tours/tournaments had increased to Rs 149.44 crore as against Rs 120.78 crore in the previous year due to increase in international fixtures on Indian soil during 2015-16. 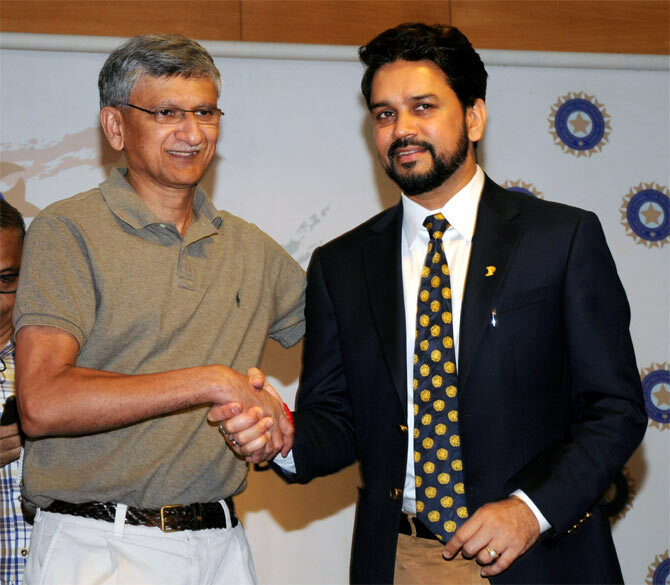 IMAGE: BCCI Secretary Ajay Shirke, left, with board President Anurag Thakur, MP. Photograph: Sahil Salvi. Gross media rights and franchisee consideration receipts from IPL 2015 were Rs 1069.75 crore as against Rs 999.6 crore last year and Chaudhry attributed the increase to the increase in media rights income. The board received a compensation of Rs 1607.58 crore (net of payment made to foreign boards) on account of termination of rights agreement following the discontinuation of CLT20. Gross media rights income from BCCI's international fixtures had also gone up from Rs 388.80 crore last year to Rs 648 crore, due to increase in number of matches held in India, according to Chaudhry. Receipts from International Cricket Council/Asian Cricket Council's share of distribution/participation fees were pegged at Rs 163.11 crore as against Rs 54.15 crore in the previous year. This increased income is mainly due to receipt of funds for the ICC World Cup 2015 held in Australia and New Zealand, according to the report. The interest income on bank deposits held by BCCI also saw an upward trend from Rs 85.94 crore to Rs 175.48 crore during the year. "The receipts in the financial year are substantially high due to the receipt from CLT rights holders towards compensation for termination of the CLT-20 Tournament," Chaudhry stated. "Further, on account of efficiency of operations and better interest rates negotiated by the office, the interest yields were the best in spite of the fall of interest rates and being conscious of the necessity of keeping the risk element to the lowest," he added. The BCCI has also increased infrastructure subsidy to its affiliated units from Rs 50 crore to Rs 60 crore, he stated.